This patient, with no history of liver disease or alcohol abuse, presented with upper GI haemorrhage due to varices. 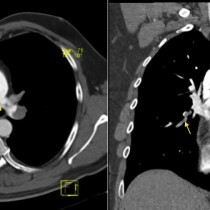 CT abdomen showed the underlying cause – constrictive pericarditis due to extensive pericardial calcification, indicated by the yellow arrows in images (a) and (c). Note the unusual elongated appearance of the heart due to the thickened pericardium. 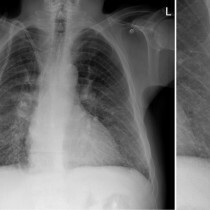 There is also a right pleural effusion, ‘P’. 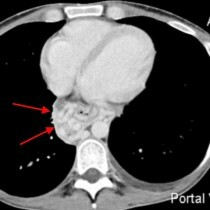 Image (b) shows an abnormal appearance of the liver. You’ll notice that it is diffusely enlarged, and has a very nodular margin rather than its usual smooth border. 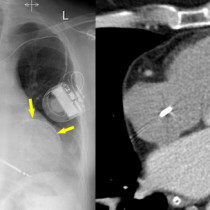 Coronal image (c) shows a grossly dilated IVC (*) due to chronic back-pressure from the right heart chambers. There are several causes of constrictive pericarditis, the most common of which (as with many conditions) is ‘idiopathic’. 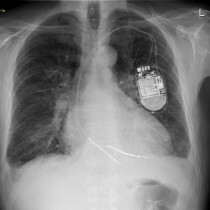 Others include previous infection, cardiac surgery, mediastinal radiotherapy, chronic renal failure and sarcoidosis. When we see pericardial calcification, as in this case, prior TB and uraemia are two of the most common causes to consider. 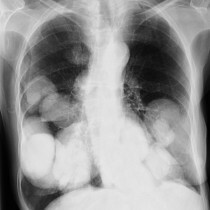 This patient had a history of TB. Cardiac cirrhosis, also known as congestive hepatopathy, can be caused by any condition that results in congestive cardiac failure but the most common causes are ischaemic heart disease, valvular heart disease and cardiomyopathy. When severe and longstanding, the hepatic congestion can progress to fibrosis and may result in the typical features of cirrhosis and portal hypertension – ascites, varices and splenomegaly.